[Strasbourg: Johann Prüss, about 1479]. First edition. Scene from Wolfdietrich's tale: an angel tries to abduct the wild woman Rauch-Else from a boat. First edition. "Hie fahet an der helden buch, das man nennet den wolfdieterich (…) Auch sagt es von dem rosengarten." 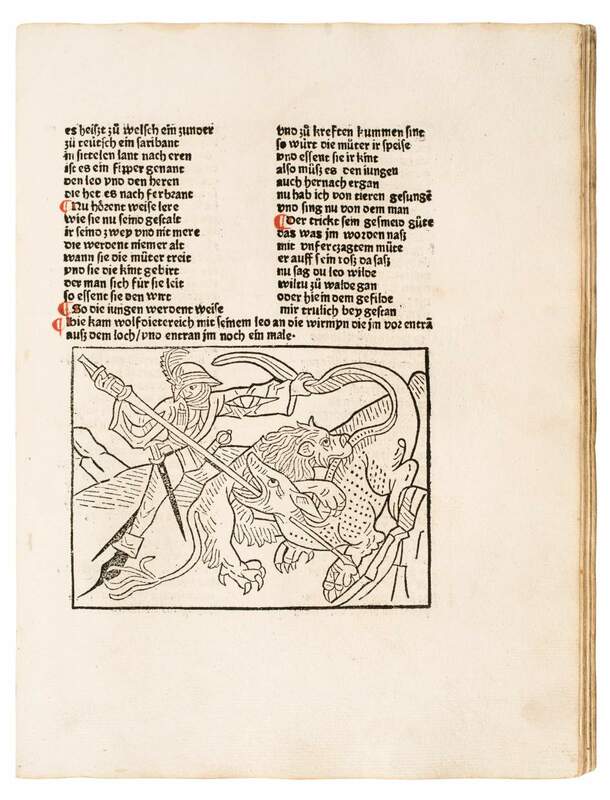 The Heldenbuch (Book of Heroes) is a collection of Middle High German epic poetry from the second half of the 13th century, some related to the Nibelungenlied. 290 x 205 mm. – 275 leaves. Three painted initials, 230 woodcut illustrations from 156 blocks, of which six are full-page. The individual narratives dealing with the heroes of the Germanic tribes during the Migration Period belong to two cycles. The first, probably of Franconian origin, includes several long, popular romances, notably those about the heroes Ortnit, King of Lombardy; Hugdietrich, Emperor of Constantinople, and his son Wolfdietrich, who sets off to fight the Dragon and gains Ortnit's widow as his wife. The other cycle deals with the Ostrogothic sagas of the tyrannical King Ermenrich, Etzel/Attila, and Dietrich of Bern (i.e. Verona), apparently derived from King Theodoric the Great, who reigned 493-526. The chief romances of this cycle are Biterolf und Dietlieb, Der große Rosengarten zu Worms, and Der kleine Rosengarten und Laurin, which tells of heroes fighting the giants and dwarfs with their magical King Laurin. The woodcuts were only used for this edition, and most of them belong to the finest examples of the early Strasbourg school of woodcutting. The compositions are widely varied, the large gestures are expressive, and the gazes of each of the figures are emphasised by large black pupils. This first edition is of legendary rarity: only ten more or less complete copies are extant.